Just imagine — the maker of the stars, the creator of not only our galaxy, but the entire universe, made you, too. He loves you, and He has a plan for you. When you follow Jesus, your focus isn't on this hour, this day, this month. Following Him means an eternal perspective, and the knowledge that you are safe beyond your circumstances, because you are in the very palm of His hand. 2 Thessalonians 3:16 offers powerful reassurance for those who believe, "Now may the Lord of peace himself give you peace at all times and in every situation. The Lord be with you all." What fills your mind in the still and dark hours of the night? How do you react when the going gets tough, the road challenging, or friends hard to find? God isn't a sometimes-God, He is our all-the-time, everywhere Lord and Savior, and there is no dark alley He won't join you in, no outpost in this galaxy where He cannot find you, and no corner of your heart He cannot reach to take away your fear and replace it with the peace that surpasses all understanding. 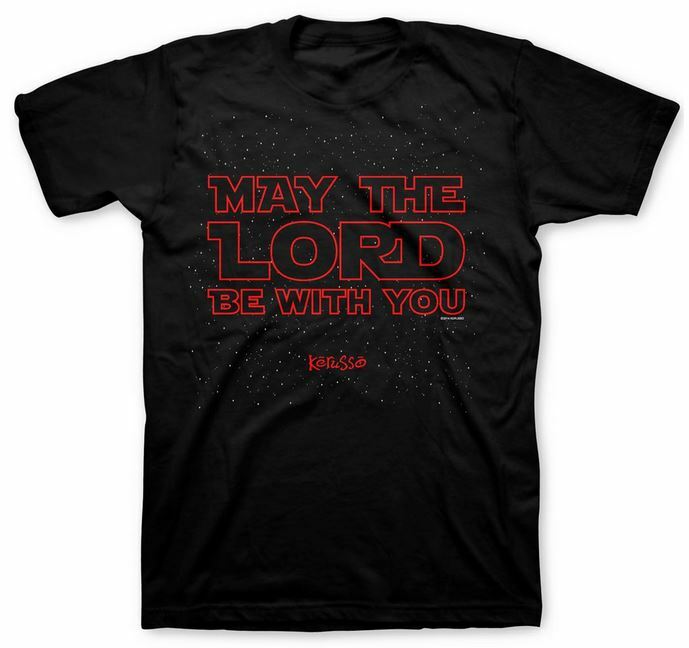 May The Lord Be With You Black and Red T Shirt X-Large was published by Kerusso in October 2017 and is our 28726th best seller. The ISBN for May The Lord Be With You Black and Red T Shirt X-Large is 612978389515. Be the first to review May The Lord Be With You Black and Red T Shirt X-Large! Got a question? No problem! Just click here to ask us about May The Lord Be With You Black and Red T Shirt X-Large.